Midtown East: We received an alarmed email last week telling us that Midtown's Zip Burger, Chef Ted Pryor's (La Goulue, Les Halles) two year-old gourmet burger joint, was closed for "renovations", even though they were meant to reopen at the end of August. We did a spot check to reveal the sad news. Place didn't reopen after the summer reno, and already a new New York City chain is taking over. 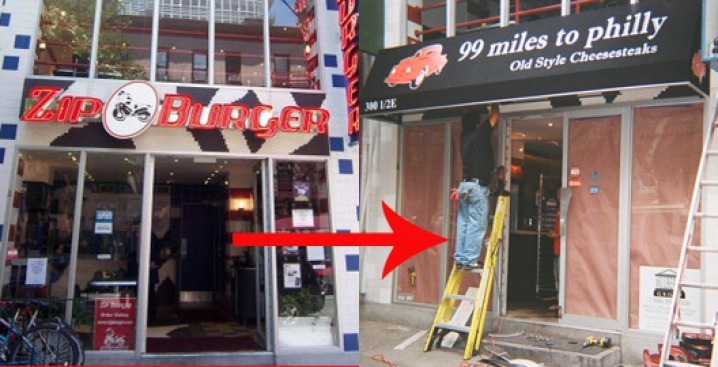 Could this be the beginning of a backlash on all the new burger places that have stormed the city from '06-present? Workers at 99 Miles to Philly said they're hoping to get the place ready to go soon.